Our corporate philosophy is based on two simple concepts - product quality and customer service. 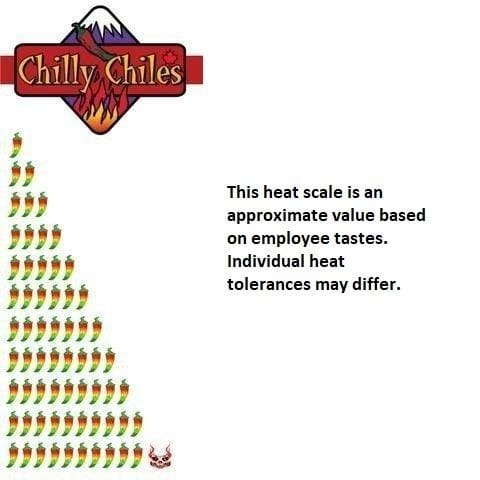 All products sold by Chilly Chiles are carefully selected and guaranteed to be of the highest quality. If you wish to return a product for any reason, just send it back within 2 weeks in it's original, resellable condition and we will refund the cost of the item. And if there are any other problems - let us know. We will always try our best to keep you happy! Most orders are shipped within 24 hours. If an item is out of stock you will be notified and you can choose to hold the order until the missing item arrives, substitute another item or cancel the item. All orders within Canada are shipped by Canada Post Expedited Parcel. We can quote on faster delivery if required. Shipping is free for orders $75 and over. What is the hottest chile pepper in the world? This keeps changing. Before September of 2006, the Guinness Book of World Records listed the world's hottest chile pepper as the Red Savina habanero. The title then went to the Bhut Jolokia or Ghost Pepper which is 3 times as hot as the the ‘Red Savina,' at 1,001,304 Scoville Heat Units (SHU).Then in February 2012 the New Mexico State University Chile Institute gave the Trinidad Scorpion Moruga a rating of 2,009,231 SHU. For the next year that was the record holder, but of course it can always go hotter. On August 7th 2013, the record was broken by the Carolina Reaper with a maximum scoville rating of 2,200,000 SHU. The heat in a chile pepper is caused by capsaicin. Most of the capsaicin is contained by the membrane that holds the seeds. Remove this and your pepper won't be as hot. How to stop the burn? The easiest way to stop the burn is to drink milk, or eat any dairy product. Sorry beer just doesn't work. If your skin is burning try rubbing alcohol.